Stanford guard Joshua Garnett won the 2015 Outland Trophy. Garnett’s win marks the first time a Stanford player claimed the award, and the first time an offensive guard won the award since 1997, when Nebraska’s Aaron Taylor took the honors. The Outland Trophy cements a tremendous NCAA football career for Garnett. The story began with Garnett suiting up as Stanford’s first true freshman offensive line starter since 2000. He logged 14 games as a sophomore on one of the country’s top offensive lines. He made Athlon’s preseason all Pac-12 team as a junior. His senior season put him atop many preseason lists, and culminated by landing All-Pac 12 first-team honors and the Outland Trophy. Garnett’s Stanford career ends January 1st, against Iowa in the 2016 Rose Bowl. Garnett’s father, Scott Garnett, played defensive line for the University of Washington in the 1980s, before the Denver Broncos selected him in the 1984 NFL draft. Joshua grew up a Huskies fan, but couldn’t resist Stanford’s offer. His uncle Steven also played Pac-12 football, at Arizona State. The Football Writers Association of America (FWAA) annually selects the best NCAA interior lineman for Outland Trophy honors. 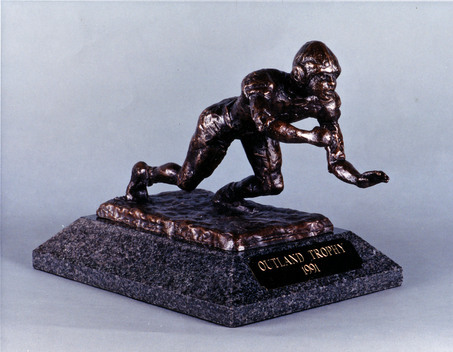 Dating back to 1946, the award stands third behind the Heisman Trophy and Maxwell Award for the oldest player award in college football. 1976 winner Ross Browner (Notre Dame) presented this year’s trophy to Garnett at a banquet sponsored by the Greater Omaha Sports Committee. 1974 winner Randy White (Maryland) also received a trophy at the banquet honoring his win. Trophies weren’t handed out at the time White won the award. To find Garnett on Twitter, visit @IamJoshG. He looks forward to an NFL career, but the human biology major plans to finish a medical degree and work as a doctor afterward. PASADENA, CA – JANUARY 1, 2013: Joshua Garnett after the 99th Rose Bowl Game against Wisconsin. The Cardinal defeated the Badgers 20-14. The Game before the Money: Voices of the Men Who Built the NFL makes a fantastic gift for any football fan!